According to old-time architectural traditions, in the ball of the cross documents related to the construction, old-time newspapers and money were placed. This cross was put on the top of the built-up church which was blessed by István Menyhár pastor, at the anniversary of publication of Luther’s Catechismus Minor and Major. 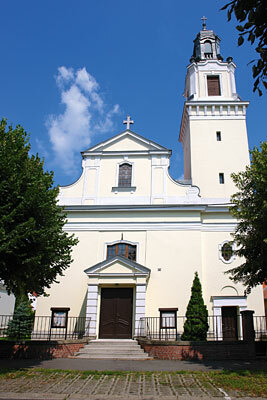 The Evangelical churchis found at the corner of the Iskola Street and Deák F. street. The style of the church is Baroque and Paleochristian, it is 18 m long and 9 m wide and its volumetric capacity is up to 300 people. It was designed by Bálint Szeghalmy who designed the Calvinist church as well. 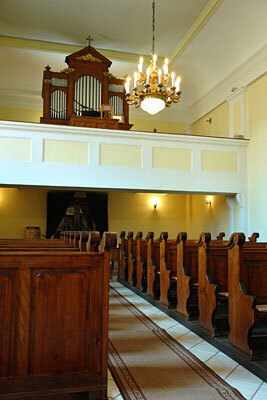 The history of evangelic congregation of Keszthely belongs to the history of evangelist church. László Festetics (785-1846) had English professionals and trades people with evangelic religion brought to his domain. In 1832 Johan Carl Anton Opel the saddle and strap craftsman from Hamburg who built up a nice relationship with the local German evangelist artisan families and with the manorial stud master who belonged to Conformist church. On Sundays he could go to worship with them to the distant church of Kővágóörs. 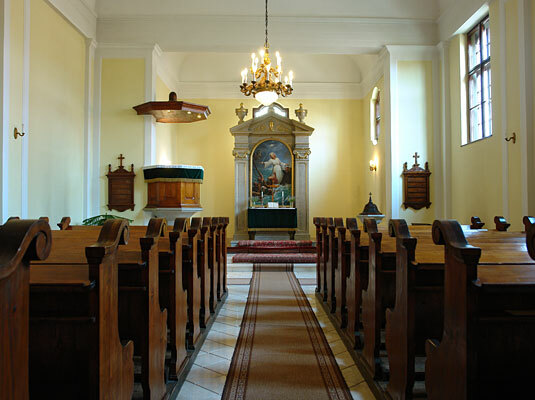 In this church he got married to Theresa Lupperspech in 1840 After his getting married started to organise his brethren to travel in groups to Kővágóörs to worship with occasions of bigger fests. 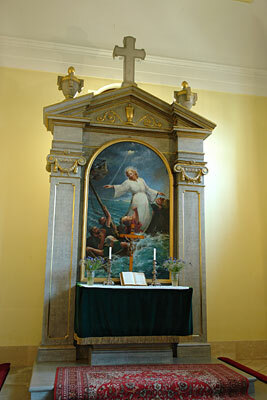 According to the unwritten traditions this time people of Keszthely called the evangelists people with opel religion. Later J.C.A. Opel’s son, Károly took the trade and looking after the evangelist followings from his father and he started the donation collection for building of the church. The building of the church started finally 28 August 1928. Balatontourist Cam…KeszthelyEntz Géza sétány 1. Hotel OvitKeszthelyAlsópáhoki út Castrum CampingKeszthelyMóra Ferenc utca 48. Hotel KristályKeszthelyLovassy Sándor utca 20. Wellness Hotel Kak…KeszthelyPázmány Péter utca 14. (hu) Palmetta Apar…KeszthelyBercsényi Miklós u. 59. (hu) Marton ApartmanKeszthelyKeszthely, Pázmány Péter u. 6. Sebestyén VendégházKeszthelyFestetics út 40. Admiral Hotel***- …KeszthelyPázmány Péter utca 1. Nádas ApartmanKeszthelyNádas köz 2. Viola VendégházKeszthelyLovassy Sándor utca 11. Villa SissyKeszthelyErzsébet királyné utca 70. Erika PanzióKeszthelyAdy Endre utca 16. Toldi68 Apartmenth…KeszthelyToldi u.68 Barbara Wellness P…KeszthelyZámor utca 2. Andrea Panzió Kesz…KeszthelyPál utca 3. (hu) Keszthelyi VS…KeszthelyMártírok útja 1. (hu) Kati Apartman…KeszthelyPipáskert u. 8. Silatti Panzió-Apa…KeszthelyRákóczi utca 72. Tokaji PanzióKeszthelyApát utca 21.